Nebraska–the latest offering from director Alexander Payne (Sideways, The Descendants)–is more of Payne’s unblinking look at the difficulty of human relationships and relatedness. 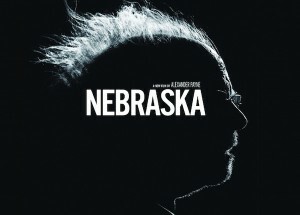 Reminiscent of David Fincher’s The Straight Story, Nebraska is in the road trip film genre, a physical journey of an old man (an unbelievable performance by Bruce Dern) trying to set things right for himself. Woody, the old man in question, is a flawed human being, but no more flawed than anyone else. He is completely average. His demon side is his drinking, and his angel side is that he wants to help everyone (and thus gets taken advantage of). He also “believes what people tell him.” Because of this, he believes he has won a million dollars when he receives a sweepstakes mailing promotion. His son David (Will Forte in a serious role, enhanced by his sad, droopy eyes, is a bit of a revelation) is an enabler, a dutiful son, a buddy, and almost a tender parent to his father all in one. He humors him and goes along with the charade. Does Woody really believe he won a million dollars when everyone around him (except David) is telling him he didn’t? Somewhere down deep, probably not, but the sweepstakes letter has become his great hope, his reason for living, and he even sleeps with it. When you discover the reason for Woody’s fantasy (I’m no spoiler! ), you will realize this film is not about dreams as I first thought it was. The screenwriter has an incredible understanding of the older generation. I think we will all see our elderly parents, grandparents, relatives or neighbors in Woody and his contemporaries. Don’t be turned off by the vulgarities in the trailer for this movie. Most of the vulgarities come from Kate and are not all throughout the film. I guess marketing figured it would be a selling point. But I know people who lost interest in the film because of the trailer. Even if you’re incensed by profanity (and the name of the Lord being frequently taken in vain), I would encourage you to look beyond to this touching (and very funny) story about truth, hope, marriage, but mostly a father and a son who have already reached an understanding even before they set out together on an impossible (or is it?) trek. Previous ArticleKaraoke: a Universal Love Language?